Kind of makes your jaw drop, but at least he’s honest. It’s exactly what this crowd wants; they’re just mostly too smart to admit it. The left tried to organize bogus plants to demonize the tea party movement. That’s just the kind of hostile-to-truth demagogic vermin they are. And tea party protesters made sure to point out the plants bearing irrational and hateful signs. Nobody at the Pro-Illegal Immigration rallies seemed to feel the need to distance themselves from this quivering pile of slime, though. He’s the real deal. What we have is an accurate and honest statement of anti-Arizona law values, in a single nutjob I mean nutshell. “La Raza” means “The Race.” As in the REAL racists in the Arizona law situation. You can go ahead and support this racist communist clown who wants to bring the greatest nation in the history of the planet down to ruin. Or you can stand with the people of Arizona who are beyond fed up with this crap. Let’s not forget to give Barack Obama honorable mention in all of this garbage. Him and his Marxist, racist, anti-American, “God-damn-America!” preacher Jeremiah Wright were at the forefront of it. This lunatic who still teaches public high school students calls police “apes of repression,” calls Los Angeles “occupied territories of Mexico,” and speaks frequently of revolution and racism. 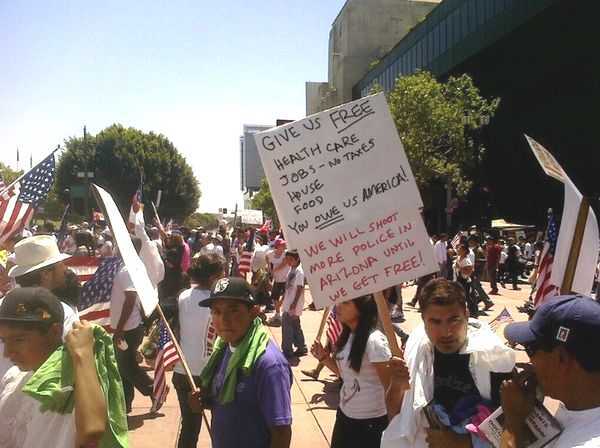 Update, June 30, 2010: There’s a new death-threatening outrage from the pro-illegal immigration side that you might also want to consider. In that article, I also deal with just how totally out-of-control the border situation truly is.